ENOCH CITY — After losing three Enoch City police officers in the month of February, City Council members voted Wednesday night to hire Officer Ryan Horton, adding him to the two-man team that has been policing the community since Feb. 26. 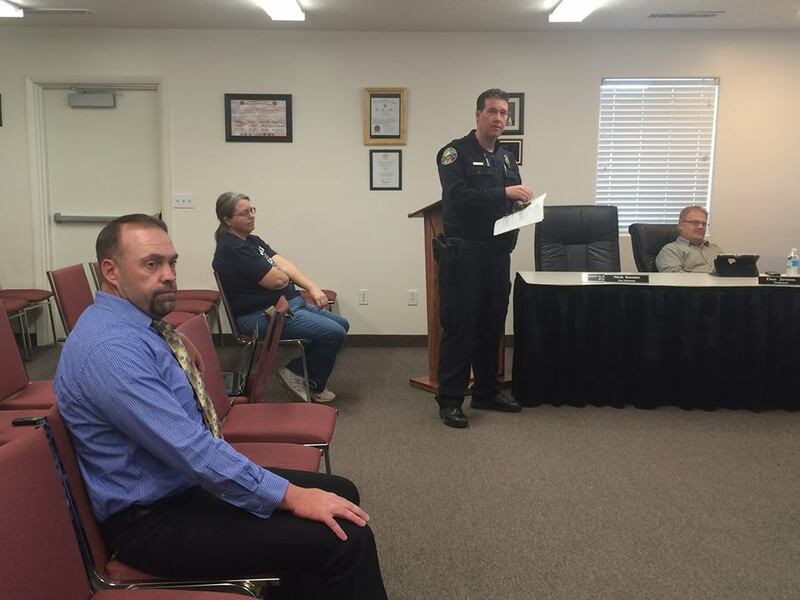 Enoch City Police Chief Jackson Ames said Horton is no stranger to law enforcement. He brings a tremendous amount of skill with him in the transfer, said Ames, and as a resident of Enoch City has a vested interest in the community. Horton’s arrival is perfect timing, Ames told council members, adding the past three weeks have been filled with long hours and it will be nice to have some extra help. Area law enforcement agencies like Cedar City Police Department and Iron County Sheriff’s Office have been a tremendous support in the past few weeks, Ames said. It is an exciting opportunity to be able to work in the town he has lived in for the past three years, Horton said. He will be leaving a position with the Beaver County Sheriff’s Office to join the Enoch City police force. Though the majority of Horton’s background has been in county police work, he spent a year working for Richfield City. Horton said he believes he is more than prepared to make an easy transition from county to city policing. Councilman David F. Owens told council members before the unanimous vote to hire Horton that he believed Horton’s policing philosophies mirrored that of what he believed Enoch was all about as a community. That philosophy definitely played a role in determining who would be the best fit for the community when interviewing, Ames said, adding the ability to problem solve within the community without escalation is paramount in such a small town. The job of a police officer is to be a helping hand to the community, Horton said, adding it’s important to him to ensure the protection of an individual’s Constitutional rights, which is what community policing means to him. “I’m all about people having their rights to move about freely,” Horton said.